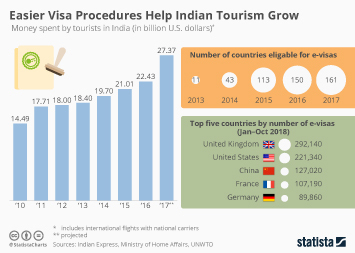 The travel and tourism industry contributed a total of 208.9 billion U.S. dollars to GDP in India in 2016 – this accounted for approximately 9.6 percent of India’s total GDP. India had the second highest total tourism GDP contribution in Asia- Pacific, behind China in 2016. India's contribution was more than double that of Thailand which had the third largest travel and tourism contribution. The industry also has a substantial effect on employment in India. In 2016, the sector directly provided more than 25.4 million jobs. In 2015, there were 8.03 million international tourist arrivals in India. This was a large increase from the 2.65 million seen just 15 years earlier in 2000. The largest source market for visitors to India was the United States, followed by Bangladesh and the United Kingdom. Outbound travel from India is also on the rise: approximately 1.1 million Indian nationals traveled to the U.S. in 2015. This figure was forecasted to rise to 1.41 million in 2020. Europe is even more popular, with 2.4 million Indian tourists traveling there in 2016. Accommodation prices in India have been decreasing in recent years. The average daily rate of hotels seen the lowest price in a decade in 2016, at 85 U.S. dollars. Despite the falling ADR, the occupancy rate of the hotel industry in India has remained stable over the last ten years at around 60 percent annually.